Nothing is quite as romantic, at least for some, as a good old-fashioned horse-drawn sleigh ride through the snowy hills of Western Pennsylvania. A number of area farms and other operations not too far from Pittsburgh offer winter sleigh rides. Just remember, sleighs need snow, so call to make sure they are operating first. Most venues require reservations as well. Holly Hill is located in the quiet farming community of Spartansburg, Pennsylvania, about 120 miles from Pittsburgh. It's worth the drive to experience winter sleigh rides, covered wagon rides, carriage rides, and trolley rides. The picturesque sleigh ride winds through snow-covered pines to a cabin where you can warm by the fire and enjoy hot chocolate. Holly Hill is in Crawford County, north of Pittsburgh and just south of Erie. You'll step into a full-on holiday world at Overly's Country Christmas in Greensburg, Pennsylvania, about 32 miles from Pittsburgh. Wander through the Christmas Village; gather around the bonfire to get warm, roast marshmallows, and sing carols; check out the model train display; and shop for gifts in the General Store. This is all in addition to a grand holiday light display and wagon and sleigh rides, weather permitting. Overly's Country Christmas is open from mid-November through Jan. 1 each year. Seven Springs Mountain Resort in Seven Springs, Pennsylvania, is the largest ski resort in Western Pennsylvania and a winter playground. 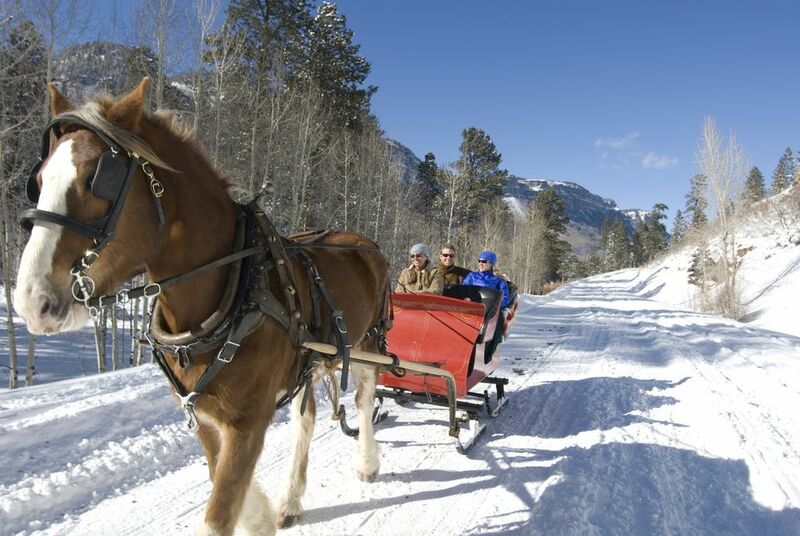 Take a winter wonderland ride through the snow astride a horse or in a horse-drawn sleigh. But that's not all you can do at Seven Springs. You can ski and go snow tubing and then go to the spa for a nice relaxing massage afterward. You can also go snowmobiling or take a snowshoe tour. Choose from four types of lodging (hotel, townhouse, cottage, or chalet), eat at 10 different restaurants, and kick back for a drink at any one of five bars and lounges. Seven Springs is about 60 miles southeast of Pittsburgh. Now, this is pretty great. Tim Swickwrath's Carriage Services is a year-round sleigh-and-pony ride service that comes to you. Enjoy a romantic sleigh ride behind a Belgian draft horse with a Victorian-costumed driver and a turn-of-the-century sleigh. When there isn't any snow, the sleigh has attachable wheels. Tim Swickwrath's is based in Pittsburgh. Misty Haven Carriage in Davidsville, Pennsylvania, about 88 miles east of Pittsburgh, offers sleigh rides whatever the weather. If there's snow, you'll be treated to a ride over 65 acres of pristine farmland woods. If there's no snow, the sleigh (with wheels attached) will take you through the streets of ​the town to look at Christmas lights. You'll keep warm with antique lap robes, and you can bring your own snacks and drinks, like hot mulled cider or hot chocolate. Dragon Run Forge & Livery, in Cowansville, Pennsylvania, about 50 miles from Pittsburgh, will take you on a horse-drawn carriage ride all winter as long as there's snow.